The rooms are named in celebration of Mary Anning (1799-1847), a pivotal figure in natural history. The Natural History Museum is delighted to announce that the Anning Rooms, an exclusive space for Members and Patrons, will open on 3 September. The rooms are named in celebration of Mary Anning (1799-1847), a pivotal figure in natural history. As an early 19th century fossil hunter, she made numerous important contributions to science throughout her lifelong exploration of the Jurassic Coast in Dorset. 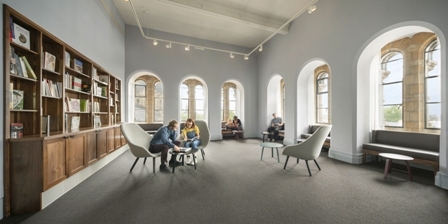 Located in the South Central Towers of the Grade I listed Waterhouse building, the long-unused rooms have been exquisitely refurbished and repurposed. They are accessed via a private door on the second floor of the Museum's central Hintze Hall, next to the giant sequoia exhibit. The space has been designed to meet the needs of the Museum's growing number of Members and Patrons. It includes a new restaurant, dining room and study. 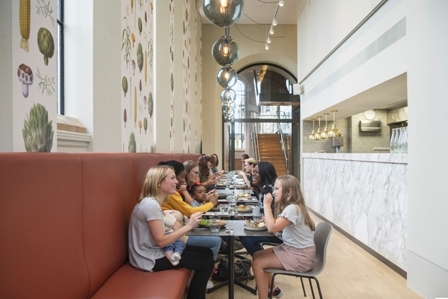 The brand-new interior celebrates nature down to the smallest detail - even the wallpaper print uses imagery from the Museum's vast collections of botanical illustrations, displaying a variety of fruits, vegetables and grains. The Anning Rooms boast unparalleled views, looking out over Cromwell Road and beyond, to Crystal Palace and the North Downs. Visitors can also get a closer look at architect Alfred Waterhouse's 1870s terracotta façade embellished by majestic terracotta beasts and delicate plants. Like in Hintze Hall, the eastern half features extinct species while the western half features living ones. Christina Heap, Head of Membership at the Natural History Museum, says, 'We are delighted to be able to breathe new life back into this neglected, historic space. The beautifully curated suite of rooms will provide an exciting, inspiring and engaging space for Members and Patrons to enjoy, celebrating the Museum's world-class collections, work and activities. The Museum commissioned Dannatt, Johnson Architects to deliver the architectural design, coordination, exhibition design and fit-out. They developed the vision for the rooms with the aim of revealing the quality and character of such a unique and historic space. The interior of the rooms showcase the work and breadth of the Museum’s collections in a new way in order to form an exciting and distinctive destination, which is aimed to delight and inspire the Museum’s members. The new interiors have been carefully detailed with subtle references to the rest of the Waterhouse building. Tiling patterns and floors refer to the terracotta coursing and mosaic-work of Hintze Hall and adjacent galleries. Terracotta window reveals and cills have been cleaned of paint and exposed to celebrate Waterhouse's work. The interpretation for each room helps link the space to the history and collections of the Natural History Museum.